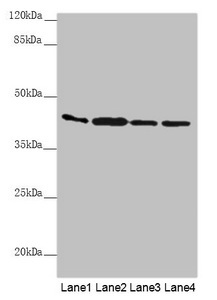 Small volumes of anti-AKR7A2 antibody vial(s) may occasionally become entrapped in the seal of the product vial during shipment and storage. If necessary, briefly centrifuge the vial on a tabletop centrifuge to dislodge any liquid in the container`s cap. Certain products may require to ship with dry ice and additional dry ice fee may apply. Catalyzes the NADPH-dependent reduction of succinic semialdehyde to gamma-hydroxybutyrate. May have an important role in producing the neuromodulator gamma-hydroxybutyrate (GHB). Has broad substrate specificity. Has NADPH-dependent aldehyde reductase activity towards 2-carboxybenzaldehyde, 2-nitrobenzaldehyde and pyridine-2-aldehyde (in vitro). Can reduce 1,2-naphthoquinone and 9,10-phenanthrenequinone (in vitro). Can reduce the dialdehyde protein-binding form of aflatoxin B1 (AFB1) to the non-binding AFB1 dialcohol. 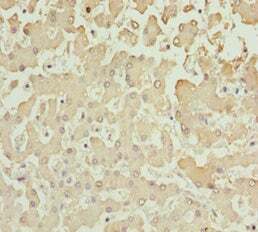 May be involved in protection of liver against the toxic and carcinogenic effects of AFB1, a potent hepatocarcinogen. NCBI/Uniprot data below describe general gene information for AKR7A2. It may not necessarily be applicable to this product. AKR7A2: Catalyzes the NADPH-dependent reduction of succinic semialdehyde to gamma-hydroxybutyrate. May have an important role in producing the neuromodulator gamma-hydroxybutyrate (GHB). Has broad substrate specificity. Has NADPH-dependent aldehyde reductase activity towards 2-carboxybenzaldehyde, 2- nitrobenzaldehyde and pyridine-2-aldehyde (in vitro). Can reduce 1,2-naphthoquinone and 9,10-phenanthrenequinone (in vitro). Can reduce the dialdehyde protein-binding form of aflatoxin B1 (AFB1) to the non-binding AFB1 dialcohol. 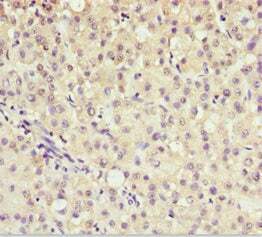 May be involved in protection of liver against the toxic and carcinogenic effects of AFB1, a potent hepatocarcinogen. Belongs to the aldo/keto reductase family. Aldo/keto reductase 2 subfamily.